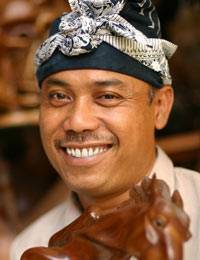 In the natural beauty of suar wood, master Nyoman Karsa has sculpted an intriguing figure at rest. In a thought provoking composition, the observer is obliged to ponder what little difference exists between crying, thinking, dreaming and resting. Meaningful and inspiring, this piece will make an extraordinary addition to any professional ambiance.